Law school friend on Elena Kagan: "She's a person who engages and she's always had a broad spectrum of friends." Law school friend: "She's extremely hard-working ... very serious about the law"
(CNN) -- In the Hunter College High School yearbook of 1977, Elena Kagan is pictured in a judge's robe and holding a gavel. Next to the photo is a quote from former Supreme Court Justice Felix Frankfurter that says, "Government is itself an art ... one of the subtlest of arts." 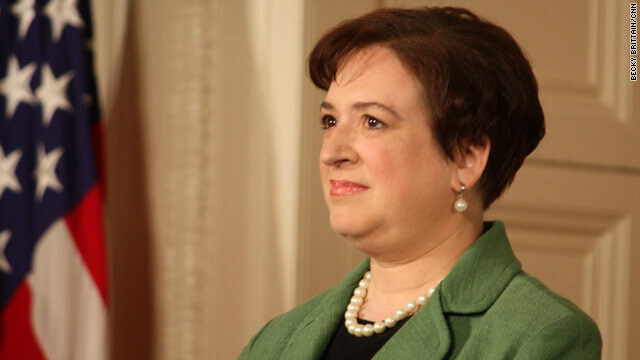 Now Kagan herself is a candidate to join the nation's highest court. Friends from her past say the 50-year-old Kagan's successful career and possible lifetime Supreme Court appointment came as no surprise. "There are always those people that want to be the class president or the student organization president and make the place better for everybody," said Ellen Purtell, who took the yearbook photo. "She was one of those people." The daughter of a lawyer father and schoolteacher mother, Kagan always had a judicial temperament, said John Barrett, who went to Harvard Law School with her. "She's a listener, a reader and thinker," Barrett said. "She's a person who engages and she's always had a broad spectrum of friends, of colleagues, of interests, and has always been very popular and successful across a wide range." Before Harvard, Kagan was an undergraduate at Princeton University, where she majored in history and was editorial chairwoman of the Daily Princetonian, the campus newspaper. Under her direction, the paper published unsigned editorials that criticized President Carter. In February 1980, one editorial called on students to participate in a rally against Carter's proposal to reinstate a draft requirement. Video: Will Kagan be 'Borked'? "The rally is not just for the 19- and 20-year-olds recently pinpointed for registration," the editorial said. "We should also demonstrate against the proposal because it is a manifestation of a growing militarism in which politically motivated bravado plays too large a part." She wrote her senior thesis, "To the Final Conflict: Socialism in New York City, 1900-1933," about the history of the socialist movement. Although some critics have cited the paper as evidence of sympathy with the Socialist Party, her thesis adviser Sean Wilentz said that wasn't the case. "Because you study something does not mean you endorse that thing," Wilentz told CNN. "You are trying to figure out a large historical process. Along with her reputation as a serious academic, Kagan also has a fun-loving side, say those who know her. "She's really a down-to-earth, unpretentious person," said Harry Litman, who co-clerked with Kagan for Supreme Court Justice Thurgood Marshall. "I've been to baseball games with her. She's the kind of person you'd like to go to a baseball game with." Kagan also plays poker and drinks beer, according to Litman, who described her as "someone who from early on has focused on the law's impact on people's lives." "I think she may grow to be a leader on the court in time," he said. "But first and foremost, she's someone who is not going to be afraid to mix it up, and listen hard, and try to take account of the other views, but she'll really I think be thinking hard about the consequences of her decisions on people's lives." To Barrett, who attended Monday's White House announcement of Kagan's nomination, his law school friend is both a New York City girl who didn't learn to drive until she was 31 and "one of the most brilliant people, maybe the most brilliant person, I've ever met." "She's extremely hard-working," he said. "She's very serious about the law. She's very serious about government and public policy and people." Kagan later became dean at Harvard Law School, where students and faculty cheered Monday's news of her nomination. As dean, she made news by trying to block military recruiters from Harvard because of the "don't ask, don't tell" policy on removing openly homosexual service members. Kagan supported other schools challenging a federal law requiring that recruiters be given equal access or face the loss of federal funding. The Supreme Court unanimously upheld the law in 2006. Critics say Kagan's stand on that issue could show she would impose personal views in her rulings instead of adhering to the law. "I thought it was just out of touch with reality," said Sen. Jeff Sessions of Alabama, the ranking Republican on the Senate Judiciary Committee. "I mean, if she opposed the policy, let her advocate against it and urge it to be changed, but not deny the people who are defending this country, who at that very moment (were) dying abroad for our freedom ... the right to come on campus." Mark Weber, the assistant dean for career services at Harvard, said Kagan's position in that instance was intended to prevent discrimination against anyone who wanted to become a soldier, gay or straight. "Everybody got that she was between a rock and a hard place," Weber said. "And the most important thing that we knew, was that she wanted to make sure that those who wanted to serve in the military were able to do so." While she is now President Obama's solicitor general, Kagan has never been a judge, raising questions about whether she has the proper experience. Supporters note other Supreme Court justices also have lacked a judicial background, including William Rehnquist and Earl Warren. Harvard Law School professor Charles Ogletree said that Kagan, if confirmed, would prove to be a centrist justice, rather than an ideologue, as the court's youngest and "most innovative" member. To Purtell, her former classmate's nomination is like the fulfillment of destiny. "If someone at the time had said pick several of your classmates that would be most likely to end up a Supreme Court justice, Elena Kagan would be one of those people," Purtell said. "She'd be on the short list."